Ah, House of the Dead. For you youngin’s out there, Sega was the undisputed champion of arcade shooters in the late 90s. From The Lost World: Jurassic Park to Star Wars Trilogy, they made some of the best games available in arcades at the time. The House of the Dead, their answer to the wild success of 1996’s Resident Evil, was an instant classic. It’s sequels even more so, as House of the Dead 2 and 4 especially have become ubiquitous with the American arcade. Since then there have been numerous ports, spin-offs, and weird things like Typing of the Dead. 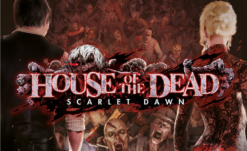 Earlier this year we finally got confirmation that Scarlet Dawn, which is ostensibly House of the Dead 6, will be seeing release in US arcades. 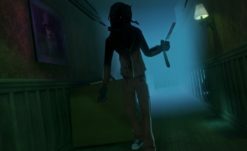 Recently we got a new trailer, showing how the series lore will be connecting to the new title, referencing series villains Goldman (HotD 2 and 4) and Dr. Curien (HotD 1 and 3), as well as an all-new rich old white bad guy as their mad plan to force human evolution comes to fruition (sounds familiar, eh?). Wonderfully, the voice acting is still quite garbage, although it does sound a touch intentionally cheesy here (as opposed to the famously trash acting from previous games), not that the series has ever tried to be anything but B movie hokey. Here’s hoping Scarlet Dawn eventually finds a home on console, PSVR or Switch or something, although that window of systems ready to support a light gun game has narrowed since last generation. It’s also stunning to see how pretty this game is, it’s a huge leap from the last HotD game, which was released for Wii and PS3.